Long-term investors should disregard this "research report." Fitbit (NYSE:FIT) is starting off the week with a bang, with shares finishing Monday up 15%. While the company did happen to announce global availability of its new Ace wearable fitness tracker for kids today, that device was initially unveiled in March. Ace does have some potential to boost Fitbit's unit volumes, perhaps building on the momentum of Versa, but retail availability isn't the type of news that would cause this kind of market reaction. Instead, the move appears attributable to everyone's favorite front-runner, Citron Research. Fitbit Ace is designed for children. Image source: Fitbit. Citron Research has come out with a fresh "research report" on Fitbit, arguing that shares should more than double in the near future with a $15 price target. That would represent over 130% upside compared to Friday's close. In characteristically sensationalist fashion, Citron says that it has conducted analysis that (emphasis original) "NO ONE on Wall Street has taken the time to fully analyze and appreciate," suggesting that sell-side analysts are incapable of reading the same public article links that are the foundation of the bullish report. One such link refers to Fitbit's recently announced collaboration with Alphabet (NASDAQ:GOOG) (NASDAQ:GOOGL) subsidiary Google, which is undoubtedly a step in the right direction for Fitbit's cloud-based digital health platform (not to mention Google Cloud's business). Despite Street analysts' purported inability to conduct research, Citron cites a JP Morgan report discussing how medical technology for diabetes is progressing at an incredible pace. The report also overplays the fact that Fitbit was selected by the FDA as one of a handful of companies that is pushing digital health forward. While the FDA's selections are important, the initiative is still in the early stages, and more importantly, the FDA is not out to move stock prices for personal gain. Fitbit has indeed been ramping up its research and development investments, which Citron points to, but that spending needs to be put into context, which Citron does not do. Fitbit is hard at work building a new smartwatch platform from the ground up, with Pebble's pieces serving as the primary foundation, along with a couple other acquisitions (Vector and Coin). Much of Fitbit's R&D spend is effectively trying to compete with Apple, in essence playing defense, as Apple Watch is taking over the wearables market. 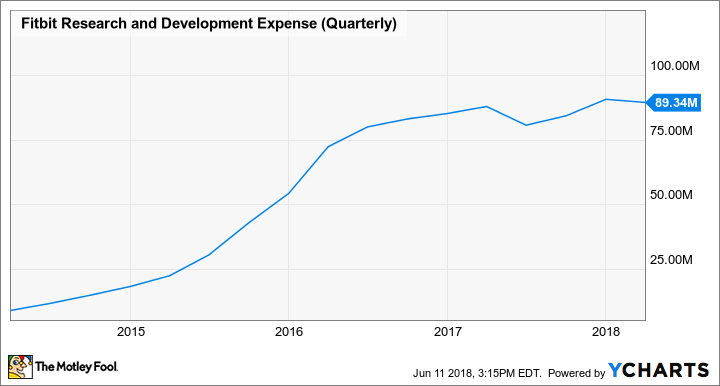 FIT Research and Development Expense (Quarterly) data by YCharts. Another mainstay of Citron reports is acquisition speculation. Citron "firmly believes" that Fitbit will get acquired within the next year, arguing that Google would be a strong candidate to acquire Fitbit. This actually isn't all that unreasonable, as Google does have a history of acquiring partners at times. Android Wear has been floundering in recent years, but the strongest argument against an acquisition is that Fitbit is trying to build its own platform that has nothing to do with Android Wear. It seems unlikely that Google would acquire Fitbit primarily for product design, but the search giant could conceivably see considerable value in the user data that Fitbit has garnered. None of this is to say that Fitbit does not have a legitimate turnaround in the works. On the contrary, the company does appear to be making meaningful progress on numerous fronts. The issue is Citron's modus operandi, which is to take positions (both long and short) in stocks prior to releasing sensationalist reports, capitalizing on the subsequent move. Long-term investors should brush off Citron as nothing more than a short-term trader while doing their own research.